Terrorists from Gaza fire barrage of 28 mortar shells at southern Israel. One of the shells exploded near a kindergarten. Terrorists from Gaza fired a barrage of 28 mortar shells at southern Israel on Tuesday morning. Residents of the communities surrounding Gaza woke up to the sounds of sirens at around 7:00 a.m. They reported hearing explosions and were asked to remain in protected spaces. The IDF subsequently confirmed that a barrage of shells was fired from Gaza at a number of locations in Israeli territory. The Iron Dome anti-missile system intercepted most of them. There were explosions inside two communities in the Eshkol Regional Council, and several were recorded in open areas. 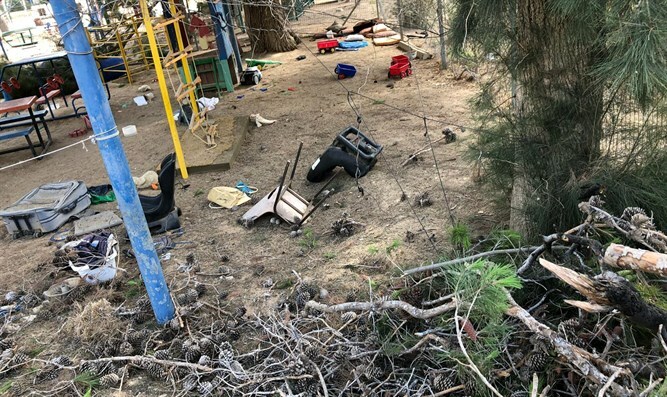 One of the shells landed near a kindergarten in the Eshkol Regional Council. There were no children in the building at the time and no damage was done. Palestinian Arab media reported that the IDF attacked several targets in Gaza in retaliation for the rocket fire. Sirens were also sounded in the region on Monday evening, as several buildings and vehicles in the city of Sderot were hit by bullets fired by terrorists from Gaza. There were no injuries. Monday’s incident marked the second time this month Sderot has been struck by machine gun fire from Gaza. On May 16, six houses in Sderot were damaged when terrorists opened fire at an Israel aircraft. Watch: Iron Dome missile defense system targets incoming mortar shells.